This weekend, we got hit with ice harder than we got hit with the snow, and ice is when it gets scary! Luckily, the husband was traveling on Friday and for some reason, I offered to drive him to and from the airport for that trip (normally, he just drives himself.) It's a good thing I did because originally, he wasn't supposed to be home until the normal workday was over at 5pm. Since Minneapolis was getting ready for a big winter storm, he thought he should get on the standby list for the earlier flight just in case. He was able to get on that flight with no issues, bringing him back home to St. Louis at 2:30pm, and us safe and sound in our house by 3:30pm. That's basically when all the madness ensued. Freezing rain left hundreds of cars stranded overnight and according to the local police, there were over 1,000 911 calls for accidents. Had I not offered to drive him, I would have been caught in all of that coming home from work at my normal time. SO THANKFUL, to say the least. Fall and winter are my favorite seasons to dress! I love when an outfit has so many interesting details to look at and that's why I love layers. Plus, it helps break up the cold, dreary, monotony of the sweater/leggings/boots combo. Not that there is anything wrong with that combo! I love spaghetti, but I might not want to eat it every day. But if you added in mushrooms or meatballs, switched to a cream sauce, or heck, even swapped the noodles for some penne, I wouldn't get so sick of it as fast! You get my point about layering? I scored this coat for a whopping $70 off thanks to the Nordstrom Anniversary Sale. I wasn't about to model this for you outside in the summer months, so I'm happy to finally get some proper photos of it for the blog! 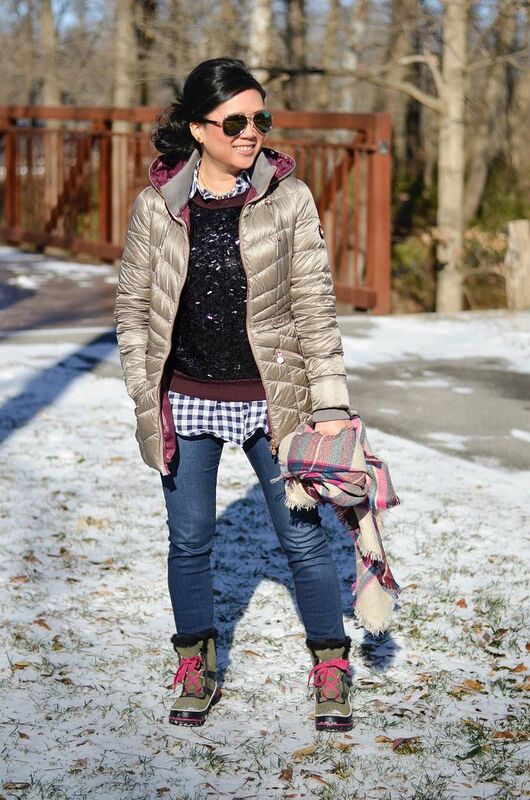 It's perfectly casual, the fit is not as bulky as you would think for a puffy coat, and even though it is packable and shrinks down to a tiny bag, it is so warm! I also have a vest by Bernardo (similar here), and now that I'm 2 for 2 with this brand, they're definitely getting a loyal customer out of me! Shopping ahead for fall and winter is often a gamble to do in the summer, but seeing that this exact coat is now sold out and its counterparts, though on sale, are still more expensive than what I paid for mine, tells me I made the right life choice! I know there is a select handful of you out there who haven't been hit with this cold weather, and while I'm not so jealous of you yet, I know I will be come February. I might complain about the cold, but December is the one time of year when I welcome snow and frigid temps! It makes Christmas feel more like Christmas when I'm freezing! And nothing beats waking up in the morning and seeing a fresh, first snow on the ground! There are seriously not many things as beautiful as that! So, while I'm wishing for my white Christmas at the moment, I'm sure I will be eating those words when all the layers start losing their appeal! 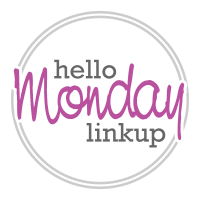 If you are here to link up, please note that Hello Monday will be taking a break after today for the holidays! I still plan to be blogging from now until the end of the year, but the link up itself will be on a brief hiatus! Hello Monday will be back with a vengeance on January 9th! Love this chic winter look! 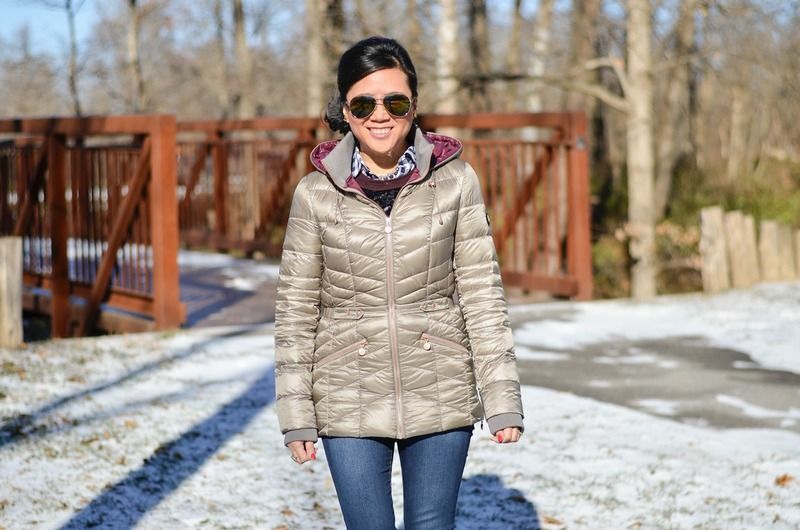 The lining of your puffy coat is such a cool unexpected details. Thanks so much for the link up and have a wonderful Christmas! I love fall and winter dressing too! I love your reference to pasta when you talked about layering--so clever (and true!) :) I'm jealous of your snow--it's cold in Rome, but we definitely won't be having a white Christmas! Enjoy!! Such a cute jacket. Glad your both safe after the ice storm. That coat is fabulous because it doesn't make you look like a marshmallow!! I love everything about this look!! The colors are beautiful and it is so casual and cool! Oh my goodness glad it worked out so well and you all made it home safely. I totally agree about loving fall and winter because of all the outfit details and this one definitely fits the bill. 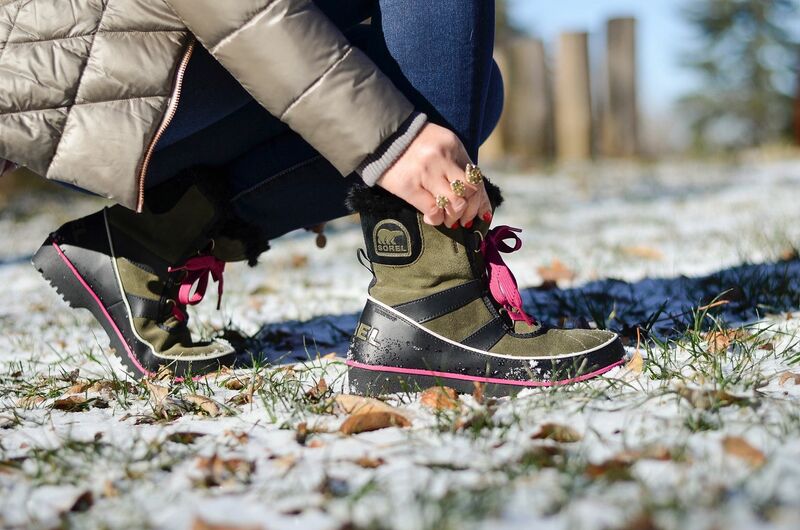 Love how you layered and your fin coat and boots! 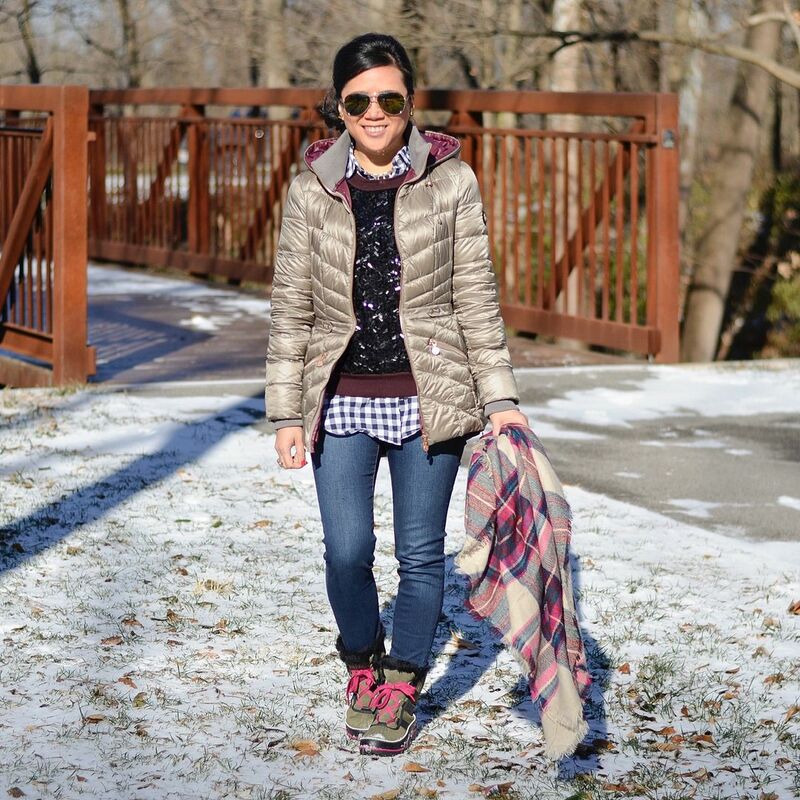 I love me some layering! And I have a very similar top to that so I think I might need to copy! What a great deal on that coat too! This looks like a perfect coat to stay warm during the winter - and good thing you didn't get stuck in the storm! I love these Sorell boots! So cool and winter proof. p/s love a good sequinned sweater, the blingier the better. 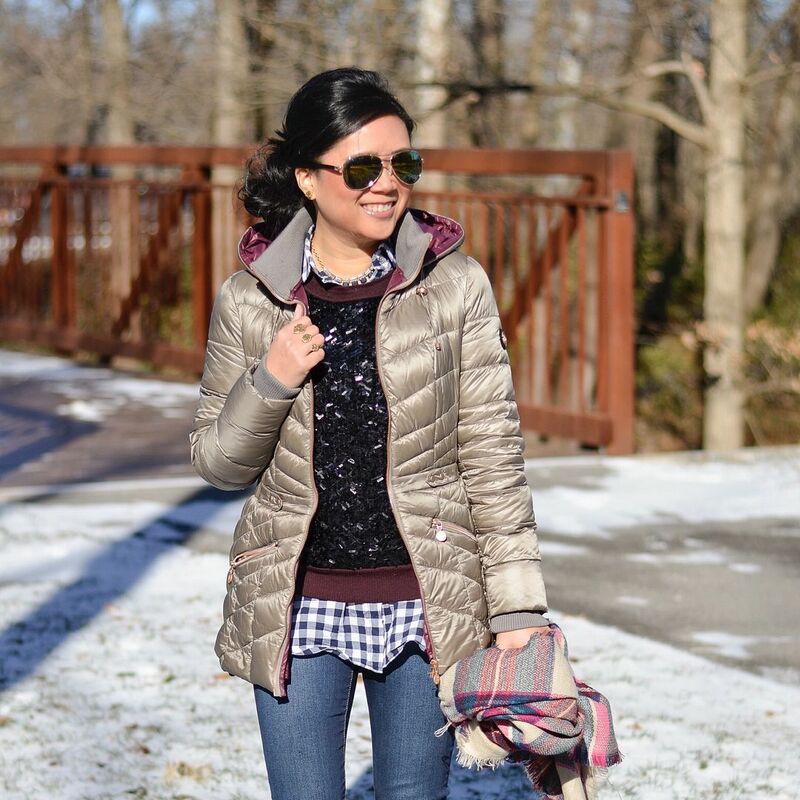 Love that puffy coat! Looks so warm and cozy!